Classified advertisements may be placed in print only, online only, or both! Inscriptions closing date for classified advertisements is one month prior to publication (for example, January issue closes December 1). AzDA does not invoice for classified advertisements. Ad(s) will be published in first available issue of Inscriptions, and cancellations cannot be guaranteed due to printing schedules. All copy is subject to review and approval by AzDA. Advertiser is responsible for canceling and renewing ads. All ads will be reviewed before approval. 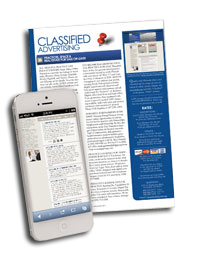 Ads submitted for our print publication will appear in the following month's issue. Ad enhancements are only available on ads shown online and the costs are associated as such. Print ads show as text only. DISCLAIMER: Classified advertisements are subject to the approval and may be edited for length and/or clarity. Renewing & canceling ads is advertiser's responsibility. AzDA does not assume liability for contents of advertisements, nor do advertisements constitute endorsement of products or services. AzDA reserves the right to refuse or cancel any advertisement at any time. Please allow 24 hours for advertisements to be posted online. The deadline for the May publication is the 14th of April. Any classified ad submissions for print after this date will not be in the May edition. This area does not shown in your ad. If we have questions about your ad, we will contact you using this information.